Symphony Nova Scotia’s popular in-school concert program returns this spring to schools in Halifax, Dartmouth, and Cole Harbour. Conducted by Nova Scotia-based composer, arranger, and music clinician Gary Ewer, these engaging concerts introduce young audiences to musical instruments, classical music, and the orchestra in an upbeat, interactive way. 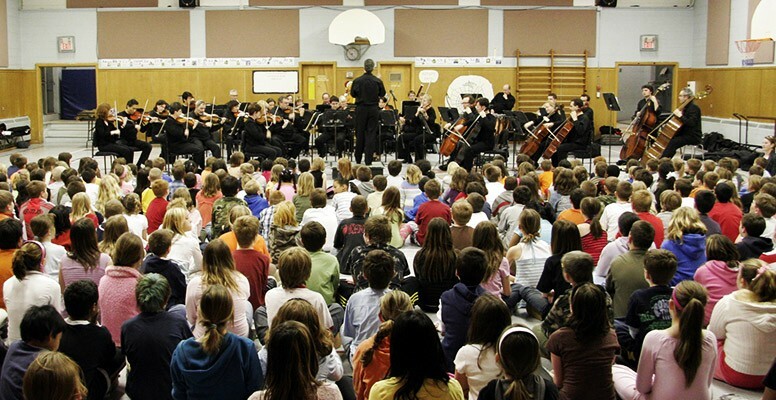 Each in-school concert provides students with a unique educational experience. This year’s 50-minute program, “The Symphony Sets the Scene,” takes a fun look at how composers can use an orchestra to do anything – from forecasting the weather to telling a story. Gary Ewer’s extensive conducting background, witty approach, and broad experience in music education make these presentations exceptional and fun learning experiences for all ages. The program also showcases individual members of Symphony Nova Scotia’s orchestra, who talk about and demonstrate their instruments and how they work. “Our audiences of the future are as critical as the musicians who will grow into the symphony players of tomorrow,” says Symphony Nova Scotia Music Director Bernhard Gueller. Other school concerts so far this season have included performances at Rockingstone Heights School, Tantallon Elementary, Beaverbank-Monarch Drive Elementary, Rocky Lake Junior High School, Ross Road School, and École du Carrefour. In-school concerts are just part of Symphony Nova Scotia’s comprehensive music education initiatives, along with open rehearsals, school matinees, the Adopt-a-Musician program, the Musical Munchkins program, the Pop Goes the Easel! program, and the Library Series. These programs allow the orchestra to share the love of musical learning with over 15,000 young audience members each year. For more information about Symphony Nova Scotia’s education and outreach programs, visit symphonynovascotia.ca.